A couple of years back one of my work mates introduced me to dubstep in the form of OPTIMUS GRYME. Having previously explored the many realms of experimental metal this artist instantly struck a chord with me. That might sound unusual but the genres of dubstep and metal are more alike than you’d think. Thundering low end bass, a driving beat, groove, sustained drones, and at times dark and ambient atmospheres. Combine the two genres and suddenly there’s an entirely whole new world of heavy music to explore. In my mind some of the earlier OPTIMUS GRYME material like the remix of INSTRA:MENTAL’s ‘No Future’ began that explorative process. 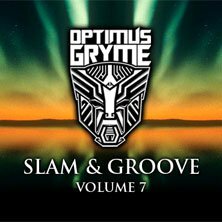 Now, on ‘Slam & Groove Volume 7’ we’re treated to what I think is OPTIMUS GRYME’s first remix of a metal song: DISTURBED’s ‘Droppin’ Plates’. Adding a electro/industrial backing to the song, this version packs more punch than the original! If you’ve followed bands like KORN you’ll already be familiar with dubstep / metal infusion after hearing their latest album ‘The Path Of Totality’. What I find the most exciting is that when you compare those remixes done by artists like DATSIK, EXCISION, SKRILLEX to OPTIMUS GRYME, it’s OPTIMUS GRYME that wins out in terms of production quality and heavyness. NZ represent! While the DISTURBED track is one of the heaviest sections on ‘Slam & Groove Volume 7’, the numerous heavy atmospheres created during this 1 hour, 16 minute-long recording make it one for the must-hear list. If you’re into dark, heavy and experimental music the vein of PALE SKETCHER and SCORN (listen to the ‘Stealth’ album) then this is for you.